1. Add swagger-springmvc dependency to your project. Note: on my client's project, we had to exclude "org.slf4j:slf4j-log4j12" and add "jackson-module-scala_2.10:2.3.1" as a dependency. I did not need to do either of these in this project. 2. Add a SwaggerConfig class to configure Swagger. 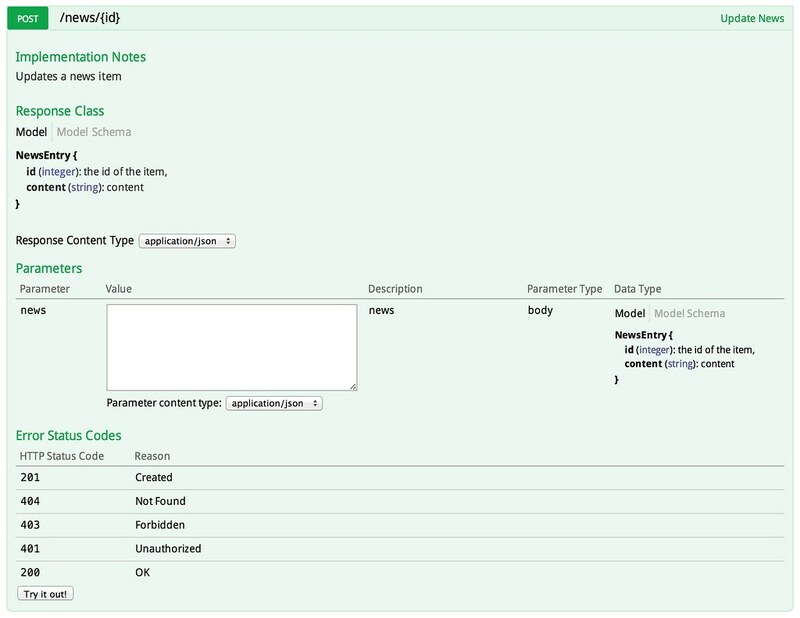 The swagger-springmvc documentation has an example of this with a bit more XML. * Required to be a spring bean as spring will call the postConstruct method to bootstrap swagger scanning. * The ApiListingReferenceScanner does most of the work. In src/main/resources/application.properties, add an "app.docs" property. This will need to be changed as you move your application from local -> test -> staging -> production. Spring Boot's externalized configuration makes this fairly simple. 3. Verify Swagger produces JSON. After completing the above steps, you should be able to see the JSON Swagger generates for your API. 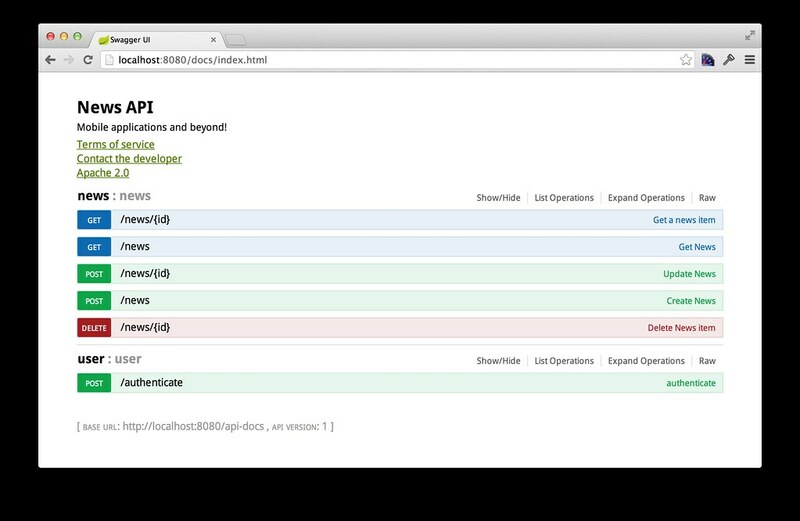 Open http://localhost:8080/api-docs in your browser or curl http://localhost:8080/api-docs. 4. Copy Swagger UI into your project. I modified docs/index.html, deleting its header (<div id='header'>) element, as well as made its url dynamic. After making these changes, I was able to open fire up the app with "mvn spring-boot:run" and view http://localhost:8080/docs/index.html in my browser. There are two services in x-auth-security: one for authentication and one for news. To provide more information to the "news" service's documentation, add @Api and @ApiOperation annotations. These annotations aren't necessary to get a service to show up in Swagger UI, but if you don't specify the @Api("user"), you'll end up with an ugly-looking class name instead (e.g. example_xauth_UserXAuthTokenController). You might notice the screenshot above only shows news. This is because SwaggerConfig.DEFAULT_INCLUDE_PATTERNS only specifies news. The following will include all APIs. After adding these annotations and modifying SwaggerConfig, you should see all available services. In swagger-springmvc 0.8.x, the ability to use @ApiModel and @ApiModelProperty annotations was added. This means you can annotate NewsEntry to specify which fields are required. This results in the model's documentation showing up in Swagger UI. If "required" isn't specified, a property shows up as optional. The QA Engineers and 3rd Party iOS Developers have been very pleased with our API documentation. I believe this is largely due to Swagger and its nice-looking UI. 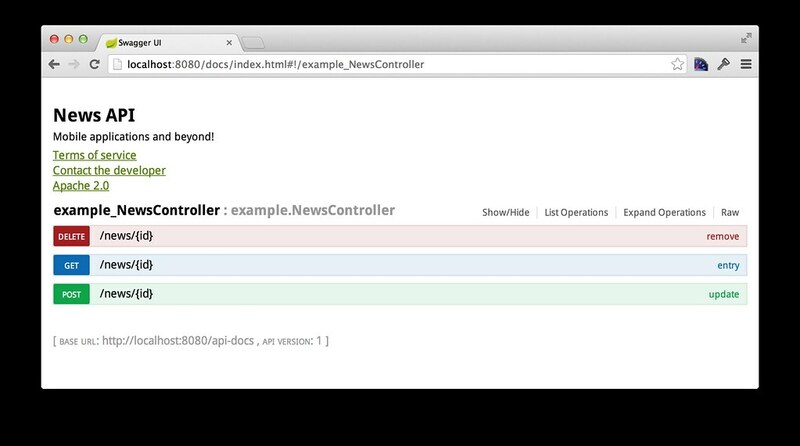 The Swagger UI also provides an interface to test the endpoints by entering parameters (or JSON) into HTML forms and clicking buttons. This could benefit those QA folks that prefer using Selenium to test HTML (vs. raw REST endpoints). I've been quite pleased with swagger-springmvc, so kudos to its developers. They've been very responsive in fixing issues I've reported. The only thing I'd like is support for recognizing JSR303 annotations (e.g. @NotNull) as required fields. To see everything running locally, checkout my modified x-auth-security project on GitHub and the associated commits for this article. Great stuff! I tried to use swagger4spring with Spring Boot with limited success. I did actually get it running but only with standard Spring Controllers as opposed to the RestController class. I also had to exclude the javax.servlet from the dependency tree (it was trying to pull in servlet 2.5 instead of servlet 3). Thanks for the pointers on swagger-springmvc. I'll look into it. Great article. I am using IBM Websphere 7.0 and while deploying spring application with swagger I get below classNotfoundexception. I think it has more to do with servlet version. Websphere 7.0 uses servlet 2.5 version. I m not sure how to get around with it. Pravin - it looks like swagger-springmvc:0.8.2 does build against Servlet 2.5. You might try asking this question on Stack Overflow. Many Thanks. It seems very interesting and looking forward to learn this technology. Could you please provide githib link for Spring Security Swagger Project? PA - it's at https://github.com/springfox/springfox. Thanks. There are so many modules, its confusing to pick right module. Could you please let me know which module should I pick it up? PA - I'd recommend looking at my boot-ionic project on GitHub. 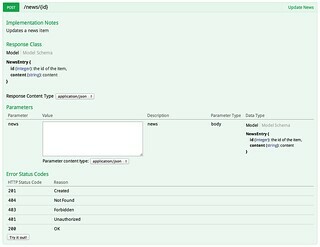 I updated it last September to show you can now use an @EnableSwagger annotation to configure Swagger. You can see it's dependencies here. My article on Building a REST API with JAXB, Spring Boot and Spring Data might help too. Hi I already have one project in Spring MVC and I am using only RestControllers for that, so as soon as I add below dependency it stops recognizing the RestController. Please help.. I am not using Spring Boot. it is a simple Spring MVC project. Diwakar - I'd suggest you take a look at Springfox. It's the successor to the swagger-springmvc project. Its Getting Started Guide should help you get rolling. Please suggest what is going on ? Neha: I'm not sure what the problem is. I'd try reviewing my steps again, looking at SpringFox (the successor to the swagger-springmvc) or asking your question on Stack Overflow. Hi can u please mail me the source code.. an sample application..